Here's something a little different that I could've never seen myself sewing: baby clothes. My friend is having a baby shower and I wanted to make a gift for the baby with a personal touch - a perfect chance to sew some leftovers. Outside of the very blue or very pink 'gendered' clothes, the shops seem to have a limited offer of mostly boring white baby grows - my friend has chosen to keep the gender of the baby a surprise. 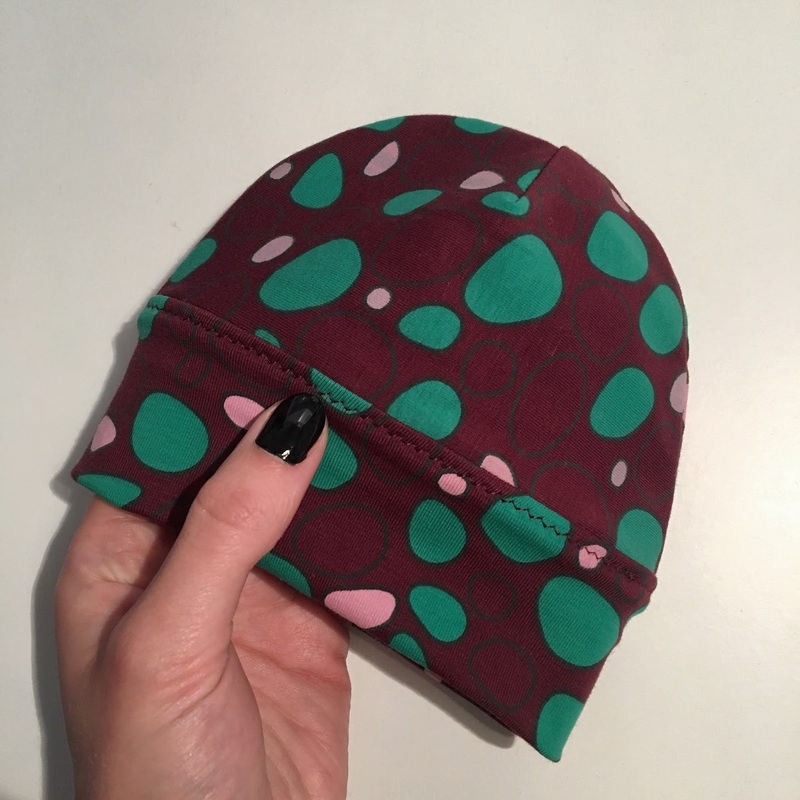 This leftover Chat Chocolat organic cotton jersey in wine, green and pink seemed perfect for some fairly gender neutral but pretty cool baby sewing. Original garment made: This Secondo Piano Basic InstincT t-shirt in Chat Chocolat organic jersey from the Solid as a Rock collection. 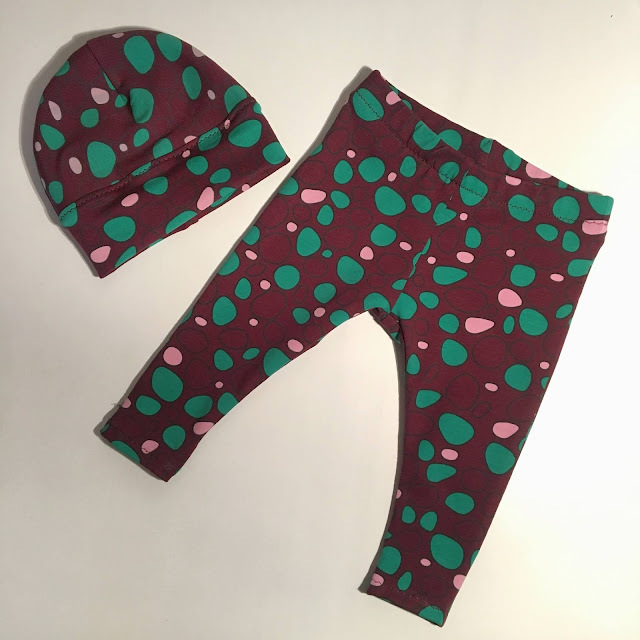 Sewing Leftovers make: Baby shower gifts for a friend - a pair of baby leggings and reversible baby hat! Leftovers-wise what did I learn? : This may sound obvious to a lot of people, but wow, baby clothes are small and require the tiniest amounts of fabric! These two pieces were the quickest and simplest makes. A great way to stop these lovely scraps going to waste by turning them into sweet gifts! I found both of these patterns by just searching 'free baby sewing patterns' on Pinterest. The hat is a slightly adapted version of one from this trio of baby hats tutorial by Zaaberry Handmade. The pattern is for 0-3months and includes a tie knot version and a version with little bear ears. 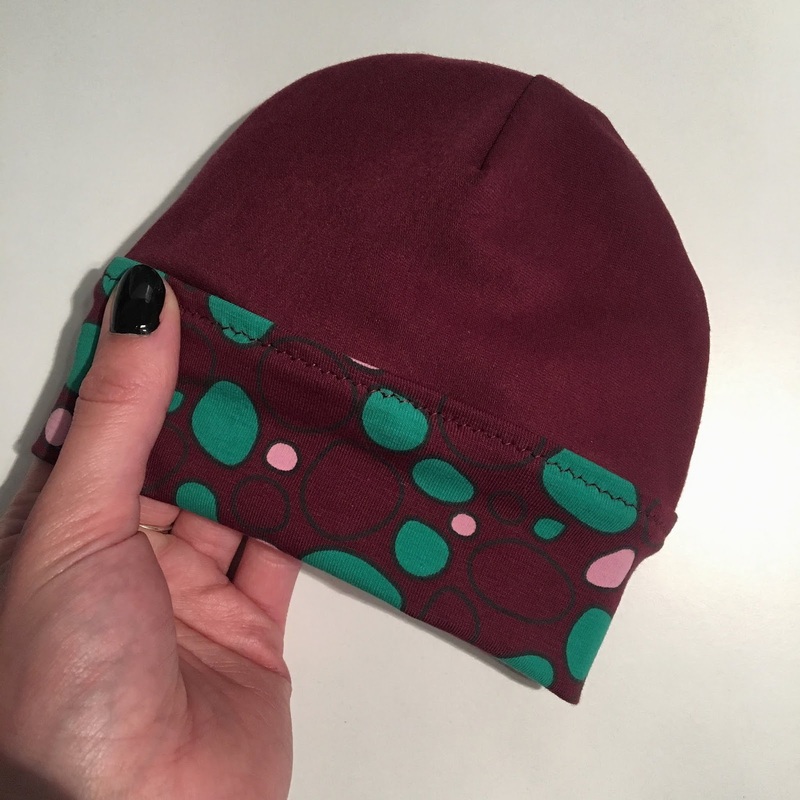 I made my version reversible by cutting an extra set of the main hat pieces and flipping them to use the wrong side - a solid wine colour. I thought this added a bit of interest, and neatened up the finish of the hat, which will hopefully make it more comfortable for baby to wear. I used a zig zag stitch to topstitch the bottom band in place, sandwiching the main hat between it. 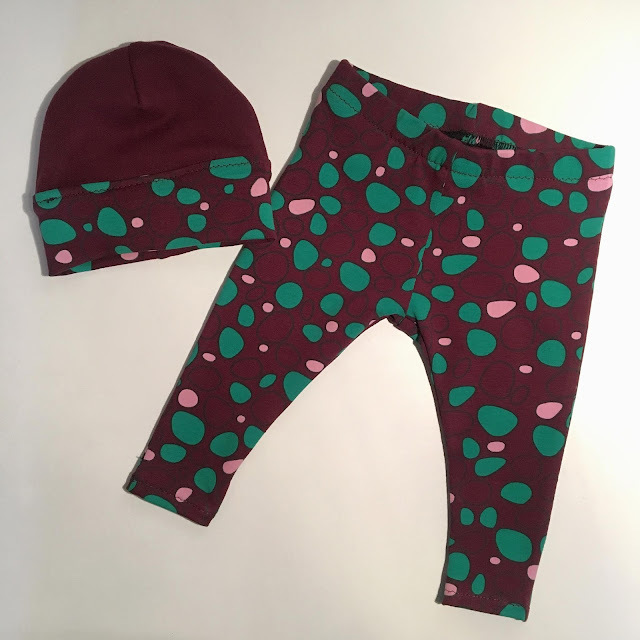 The baby leggings were meant to be the main piece, but I actually think the hat turned out cuter! They are a little bit bigger, which might explain it - the sizing didn't start at newborn. 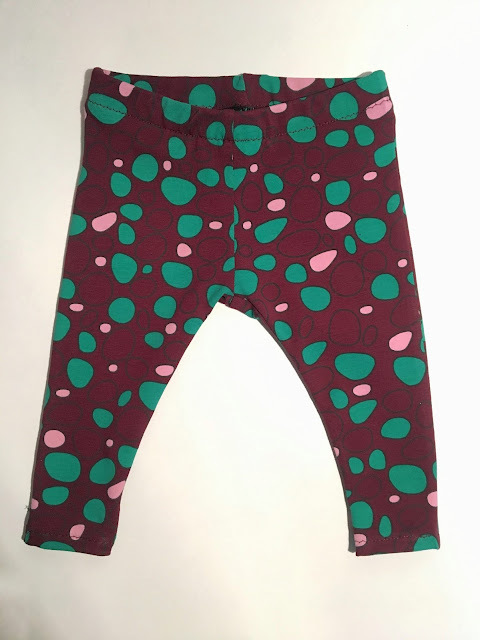 I used the Baby Go To Leggings pattern by Andrea's Notebook - another freebie - which has 3 sizing options: 3-6 months, 6-9 months or 9-12 months. As a warning, the written instructions in step one wrongly tell you to sew the fronts together along the outer edge, and then repeat with the backs. This step should be 'sew one front leg to the corresponding back leg along the outer edge'. Unfortunately I followed it blindly and ended up unpicking my overlocking - the worst of the worst sewing tasks. Once I'd gotten over this, sewing them was a breeze. I already had a scrap of elastic in my stash for the waistband too, so it was an all round leftovers project. Using the overlocker for both projects made them seriously fast little sews - a sort of warm up to my main sewing of the day, which is coincidentally also with leftovers, this time from this project. I'm sure there're many other scrap-busting baby patterns out there too - if you have any favourites, please suggest them in the comments so we can grow a little resource of possible patten picks. Did you see that November was Sustainability theme month over at The Sewcialists? I had the opportunity to talk about the positive impact that practicing sewing leftovers has had on my own sewing habits. Read my piece here and get inspired by some of the other things sustainable sewers are doing to tackle waste and sew more mindfully here. Happy to know about your baby shower. My friend is also planning first birthday party of her daughter at one of the centralized event locations in a couple of weeks. Snacks and desserts will be of common choices. Cake design will be princess and fondant cup cakes will be ordered. Hope all her efforts are appreciated by the guests.